Weight Gain: 30 lbs - I've been dreading that number. Ho hum! Stretch Marks: It's hard to tell, but there may be the makings of some around my belly button...keepin on with the lotion. 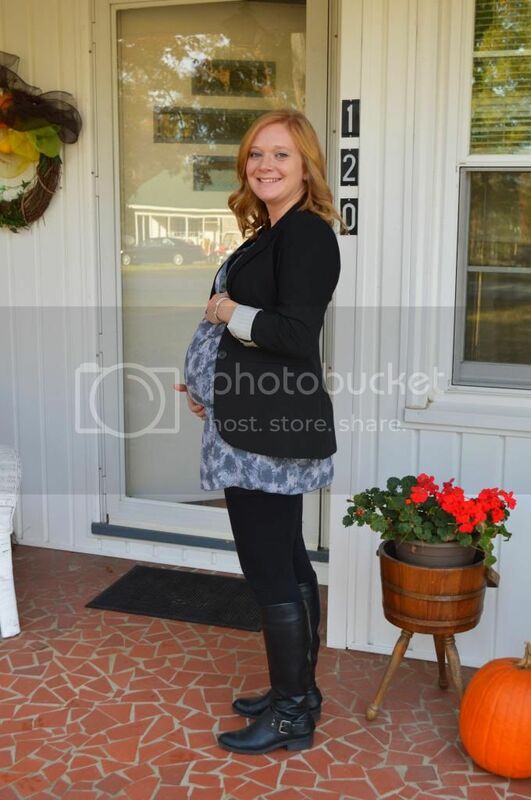 Maternity Clothes: Oh yes! P.S. It's so hard to figure out what to wear to showers! Movement: He is a restless little thing! Since he is getting bigger I'm feeling him move the entire day. I love it. Every once in a while he moves really quickly or hits something just right and it gives you that dip in the tummy like when you're on a roller coaster. I'm not gonna lie...I kinda like it. Sleep: Eh. Thankful for a loving husband that quietly escapes the bed, keeps the dogs out of the room, and lets me continue resting when I can. Missing: Wine. Still. I have a feeling this will last the next 8 weeks. Loving: The cold air. I love having a need to drink cocoa, wear slippers, and turn on the gas logs. Craving: Just some quiet time. Time to reflect on the last few months, prepare my heart and mind for what comes next. I really just want to soak this all in before its over. Feeling: Blessed. A healthy baby boy. It's literally the best feeling in the entire world. Looking Forward: We have another shower this weekend with friends. I'm especially excited that some of my friends I've made from blogging are coming! Seriously, the friendships I've formed are awesome. Best Moment(s): Last Saturday was our family shower down here (we will have another one at home after Thanksgiving) and Wednesday my coworkers showered me with gifts. We are beyond blessed and grateful for the amazing people in our lives that have gifted us so many great things. One of the best friends I've made since moving here at my shower. Cocoa and a firepit on a Friday night. Yes, please and thank you, hubby. Baby bedding is checked off the to-do list! Have a great shower this weekend!!! That will be so fun! Hope you have a great shower this weekend! Loving his bedding! Have a blast at the showers. You're such an inspiration to me! Glad you are feeling good! Love your boots, so cute! Also love your baby bedding, the elephant pattern is one of my faves :) Only 8 weeks to go! I can't believe our babies will be here so soon! Time is flying!